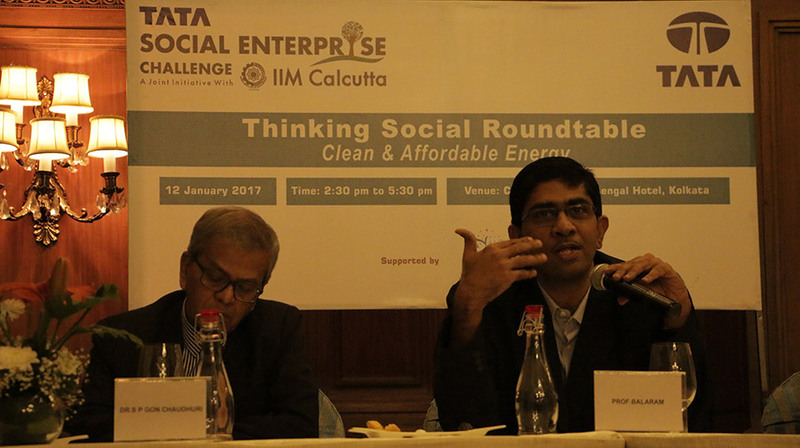 IIM Calcutta Innovation Park in association with the TATA group hosted the annual event of the ‘Thinking Social Seminar’ roundtable session on the theme “Clean and Affordable energy” at Kolkata on January 12, 2017. The primary objective of this event was to showcase how the global access to modern and renewable energy and clean fuel is fundamental to meeting several challenges the world is currently facing, including poverty, food security, climate change, clean water, health and inclusive economic growth. The speakers of the seminar comprised of eminent power utility companies like Tata Power, Tata Cleantech Capital Limited and distinguished personalities from renewable energy sector who are well established and have impacted the lives of thousands of people. Professor Balram Avittathur, Professor Operations Management, from IIM Calcutta, in his inaugural address spoke about why the renewable technologies are considered as clean sources of energy and how the optimal use of these resources could minimize environmental impacts, produce minimum secondary wastes and also are sustainable based on current and future economic and social societal needs. Mr. Arunavo Mukherjee, Vice President – Advisory Services, Tata Cleantech Capital Limited shared his experience in energy industry spanning coal, natural gas and renewable sources. Mr. Mukherjee shared his experience with the Tata group since 1991 how he was instrumental in leading the Tata group effort to combat climate change across its 100 companies. Mr Mukherjee also explained how Tata Capital and International Finance Corporation have come together to form Tata Cleantech Capital Limited (TCCL) with the aim of providing the right advice and funding effective solutions. TCCL now address one of the key issues in building a sustainable framework and has now the ability to bear long-term and capital-intensive expenditure. Dr. S.P.Gon Chowdhury, Former Director. West Bengal Renewable Energy Development Agency, spoke about how the off-grid PV system with mini-grid concept has received renowned recognition and is now the most viable technology options for off grid energy and is also the most promising and emerging technologies to scale up in the future. He also explained how the renewable energy power generation is still relatively expensive in spite of its various advantages. So in order to make renewable energy cost effective demand side management is very important. Dr. Gon Chowdhury was also very optimistic that if the Indian government adopts this policy process, it will greatly help in making off-grid energy mainstream, which is currently not the case. Adoption of such a policy initiative would also help scale-up the off-grid market. Mr. Vinay Jaju, COO, Onergy Solar, (a renewable energy venture), is aimed at providing complete energy solutions to eastern India, with special focus in the rural areas, which are energy deficient & economically backward. The target of Onergy solar is to create a sustainable and equitable India by providing access to clean energy by energizing rural India by promoting lighting, cooking, cold storage, solar irrigation and electrification solutions. Onergy also services corporates & institutions through its product offerings & system integration services. Mr. Mithun Chakraborty, Assistant General Manager, Tata Power Delhi Distribution Limited (TPDDL) highlighted the ambitious Govt. target on Renewable Energy especially Solar and the challenges that Discoms are going to face in integrating large amount of distributed solar into the grid. Also, the issue of existing Power Purchase agreements which need to be handled and the effect on cross subsidies as large industrial and commercial consumers move towards solar rooftops. Further, the alternatives such as demand response and battery storage on which discoms have to work on to mitigate the challenges of infirm renewable generation. The discussions were followed by an interactive question and answer session where the experts addressed the queries raised by the audiences on how the solar industry has given the solar companies a unique platform to distinguish themselves from the competition and have also proved how innovative they really are. The range of innovations encompasses the entire value-added chain of innovative battery and energy storage technologies – from components to production to concrete applications and business models, the government’s policies and interventions on solar policy and reforms etc. In the next session, Prof. Asok Banerjee, Director, IIM Calcutta Innovation Park shared the journey of “Thinking Social” – one of the flagship event of IIM Calcutta conducted in partnership with the TATA group. Prof. Banerjee accentuated the primary objective of the event which was to build awareness on social entrepreneurship, generate interest and inspire the young generation to come up with innovative solutions to address social challenges. As part of this initiative, IIMCIP conducts several seminars, roundtables and lecture series across India, which culminates into our flagship business plan contest called – The Tata Social Enterprise Challenge. In the current year i.e. the 5th edition of the TSEC business plan contest over 200+ impact proposals of social ventures from all across the world. The snapshots of the top 20 participants of this year’s TSEC event were also presented to the audience. The roundtable concluded with a vote of thanks followed by a press meet where the IIM Calcutta Innovation Park team comprising of Prof. Asok Banerjee, Director IIM Calcutta Innovation Park, Mr. Subhrangshu Sanyal, CEO IIM Calcutta Innovation Park, Prof. C. D. Mitra, Advisor, IIM Calcutta Innovation Park, who highlighted the role of IIM Calcutta Innovation Park in social entrepreneurship space and how the ‘INVENT’ program would be addressing the challenges and barriers across the inclusive innovation lifecycle, for the benefit of up to 1m poor people at the bottom of the economic pyramiding the low income states of India and in low income countries.